You've surely heard some stories about surviving twin pregnancy bedrest. You may have even heard that most women carrying twins will have to endure this "treatment" at some point. In any case, there's a lot of information that we'll discuss here, but always talk to your OBGYN or other professional about your particular pregnancy. Surprisingly, the subject of bedrest has become a bit controversial among doctors and other healthcare professionals. The argument being about the true benefits of going on bedrest during a twin pregnancy. Before we get too far, let's talk about the basics. What is Twin Pregnancy Bedrest? Bedrest is generally prescribed by your doctor during twin pregnancy for a number of reasons which we will cover in a moment. Essentially, you are required to remain in bed and off your feet...Simple, huh? Well, there are actually varying degrees of this particular treatment that can last days, weeks and even months. Remember, each pregnancy is different for each individual and should be thoroughly discussed with your doctor as to the best course of action. In serious cases, "complete bedrest" may be ordered, in which you are to remain laying in bed at all times, except to use the bathroom, quickly bathe and/or change clothes....And, sometimes, not even to perform those tasks (this type of strict bedrest would likely take place in a hospital or with the help of an in-home nurse). There is also what is known as, "modified bedrest". Modified bedrest can be just about any variation your doctor deems helpful to your particular situation and symptoms. Ranging from a few to several hours of sitting or lying in bed per day, with some to no restrictions on basic activities. Why Bedrest During Twin Pregnancy? Does Twin Pregnancy Bedrest Really Work? Here's where we will tackle the bedrest controversy. Unfortunately, there have not been many studies done on twin pregnancy bedrest (let alone singleton pregnancy bedrest) regarding the benefits and/or negative effects. One group of professionals believe that without enough studies proving negative effects, bedrest should be given a chance. The other group reasons that bedrest itself may, indeed, cause negative effects and that it should not be prescribed until more is known about it's outcome. Generally, most caregivers land in the middle and opt for some type of modified bedrest ,believing that reduced activity should account for something. Josten, LaVohn E., Kay Savik, Sara E. Mullett, Ronald Campbell, and Pauline Vincent. "Bedrest Compliance for Women with Pregnancy Problems." Birth 22.1 (1995). "In the not-so-distant past, women who carried multiple babies could almost always look forward to a long sentence of bed rest. Doctors once assumed that bed rest would reduce a woman's chance of going into labor too early, but the practice is falling out of favor. According to a 2002 report in Nursing Research, routine bed rest has never been shown to prevent premature births. In fact, some studies suggest that bed rest may actually INCREASE the risk of premature birth for healthy women carrying twins. In short, the value of routine bed rest for women carrying multiples is uncertain. If your doctor recommends bed rest, ask him or her to explain the potential benefits. If you're not satisfied with the answer, you may want to seek a second opinion". If you find yourself having to deal with the predicament of bed rest, there is help and support for you. Many moms have been there and many more will be experiencing it right along with you. Almost all will tell you what an adjustment it can be and also how to fight the inevitable boredom it brings. The reality will be tougher for some than others. People who don't have a lot of help, have other young children, financial issues, etc. may find themselves feeling extremely overwhelmed, depressed and quite helpless at times. Be sure to discuss all of your concerns with a professional and/or your partner. Don't think you have to go it alone or prove anything. This may be the one time in your life when additional help from family and friends will truly make a world of difference. Assign someone to do the grocery shopping, another to help with the laundry, someone to walk the dog, etc. Be sure to have all the essentials within arms reach. Think phone, remote control, laptop, snacks, bottled water, books, etc. If you have the benefit of a laptop computer, ipad, kindle or other device connecting with other moms will be a lot easier. There are several sites and blogs that deal specifically with the topic of twin pregnancy bedrest that can offer support and encouragement. Not to mention, all the other opportunities the internet provides. You can catch up on e-mails, start a personal blog, download music and shop for everything under the sun. Just taking a little extra time each day to change clothes, fix your hair and maybe put on some lip gloss will give you an added boost. There are even some beauticians who offer in-home manicures and pedicures, so don't forget to call your local salons and inquire. Whether it be on one of the current, modern gaming consoles, on your phone, or with a simple deck of playing cards, this type of entertainment can keep you busy for hours. It seems we all have a trunk full of old photos just waiting to be organized. Why not use your time to create some family albums? If you have digital photos, consider organizing them into fun photo books that you can upload and order online. Writing is a wonderful way to pass the time. You can create a lasting memoir about your unique twin pregnancy to share throughout the years with a twin pregnancy bedrest journal. This would be the ideal time to catch up on all of your TV shows or those movies you've been wanting to see. If you're someone who really enjoys reading, now is a great time to capitalize on your free time. You may even want to subscribe to some parenting and/or pregnancy magazines. Check out our guide to books for ideas. This might sound silly considering you're on bedrest, but staying in one position for too long is likely to cause muscle aches and cramping. Simply changing position from one side to the other or from laying to sitting should help alleviate some of the discomfort. Don't forget to get yourself one or more bedrest pillows. 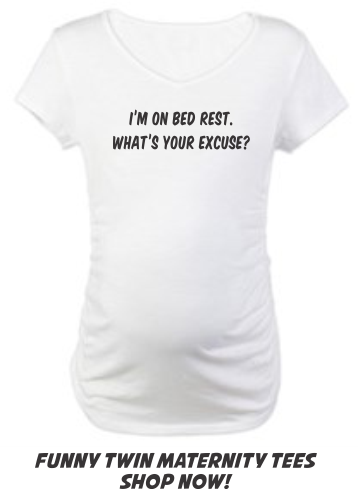 There are several available designed especially for pregnant women. Keeping a positive attitude might be trying at times, but will ultimately be one of your biggest allies in getting through your confinement. Just remember the two most important reasons you're on bedrest, your twins!